SUBCOE is a YASKAWA OEM Partner Company for the manufacturer of VFD systems for Electrical Submersible Pump systems in International Oil & Gas applications. Our in house technical capabilities are reinforced by the full knowledge and support of the YASKAWA factory, our product designs are factory approved and are fully warrantied. Our EnerDRIVE drive line was originally developed for application between the temperature extremes, when properly specified they are applicable from -45C to +60C in the harshest of environments. Normal industrial drive systems are rated for -10 to +40, any deviation beyond this invalidates warranty, requires severe derating and in the worst case causes catastrophic failure. SUBCOE has focused significant research and development time and resources to reliably expand the operating window of our drive packages. We significantly improved thermal design and performance of the various component parts to ensure they function in a reliable and effective manner with minimal operational maintenance requirements. SUBCOE EnerDRIVE VFD are normally NEMA4 /IP65 or NEMA3R / IP54 rated, integrated or external NEMA3R / IP54 input and output harmonic filtering is installed when required. We offer Regenerative Active Front End systems as well as more standard 6 & 12 Pulse front end IPWM drive systems with 18 & 24 Pulse systems available on request. Other devices connected to the Digital and Analog inputs of The CUBE VFD. Monitor and record relevant operational parameters such as motor current / voltage, VFD current / voltage / frequency, and DH measuring devices. The CUBE VFD has a variety of Alarms for each monitored parameters of the system. Each Alarm must be set properly to protect the VFD, the transformer, the motor, and cables from failure. All SUBCOE EnerDRIVE VFDs offer a number of advanced features to optimize the performance of the system, including comprehensive management of data monitoring. 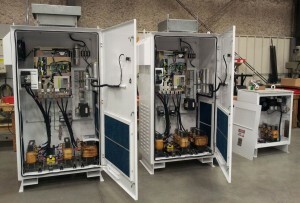 For example, a special function may be enabled within the CUBE VFD to allow connection of compatible Downhole Tools (DHTs) on the Modbus system. In this case, the DHT output data will be displayed on the CUBE VFD screen and accessed through its menu system. DHT Data may be used to logically control the VFD speed to optimize production and may be logged into the main memory of the CUBE VFD as Trend files for further analyses. SUBCOE Trendview is free software written by SUBCOE for the analysis of CUBE generated trend files, it which allows the data to be manipulated, analyzed, printed in linear and circular formats and the benefit of SUBCOE Trendview is that it can address an unlimited number of data points when other software is limited. The full family of EnerDRIVE Drives are user configurable to operate on regular international power supplies of 380V to 600V at 50 or 60Hz, and at 6, 12, 18 or 24 pulses. The ED-1000 drive family is ideal for normal-duty usage indoors at 40°C. These units are used in control rooms and offer the convenience of a NEMA 1 enclosure. The ED-1100 range operate with an input / output voltage of 600V. The ED-3000 drive family takes the basic ED-1000 drive package into an outdoor setting. Cooling is achieved by filtered ambient air flowing through the cabinet. It has a NEMA3R enclosure rated for a maximum ambient temperature of 45°C. The ED-3000 is the most common drive series and works well in most environments providing users with good reliable performance at reasonable cost points. The ED-3100 range operate with an input / output voltage of 600V. The ED-4000 drive family is designed for use in harsh locations where a fully sealed enclosure is a necessity instead of a choice. These VFDs are rated for either a 45°C or 55°C ambient temperature, depending on the installed cooling system’s specification. 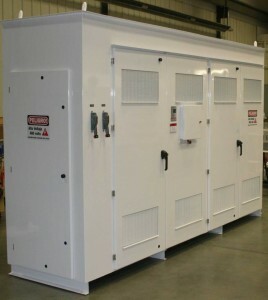 Where necessary in lower capacity drives air-to-air intercoolers provide cabinet cooling, there is no air-conditioning. These intercoolers are refrigerant-free heat transfer devices that reduce internal cabinet temperatures without using air conditioning. In larger drive systems a proven air-conditioning system is used to maintain acceptable enclosure temperatures regardless of external ambient conditions. The ED-4100 range operate with an input / output voltage of 600V. The ED-6000MV drive family operates at medium voltages of 2.4kV to 6.6kV and uses an array of low-voltage components to create complex multi-step output waveforms. With the basic drive generally meeting or exceeding IEEE519, there is no longer a requirement to select inverter-rated motors, the EnerDRIVE MV systems may be retrofitted to older installations without changing the existing motors. 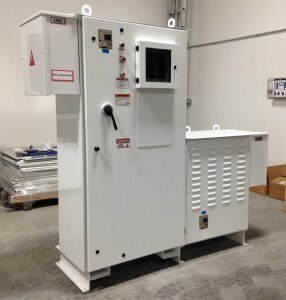 Systems are available in NEMA 1 and NEMA 3R packages, and they are available with input voltages ranging to 13.8kV. All drive systems are currently air-cooled; however, fluid cooling is expected to be introduced in 2009. The ED-7000R is similar in function to the ED-6000 with the exception of its fully regenerative variable frequency drive. The VFD features an active rectifier section that draws power from the grid and, when over-driven, injects regenerated power back onto it. These energy sources can be used to regenerate power and offset the overall costs in any operation that requires driven motors, running pumps, belts, or other similar tools, with the potential to over-speed, push, or coast high inertia loads. The EnerPACK drive family are fully integrated Drive Systems that incorporate the VFD and input filter for IEEE519 compliance, output filter for motor protection against voltage degradation and optionally oil filled or dry type step up transformer. This fully inter-connected combination drive pack has a significantly smaller footprint than a traditional collection of separate components.